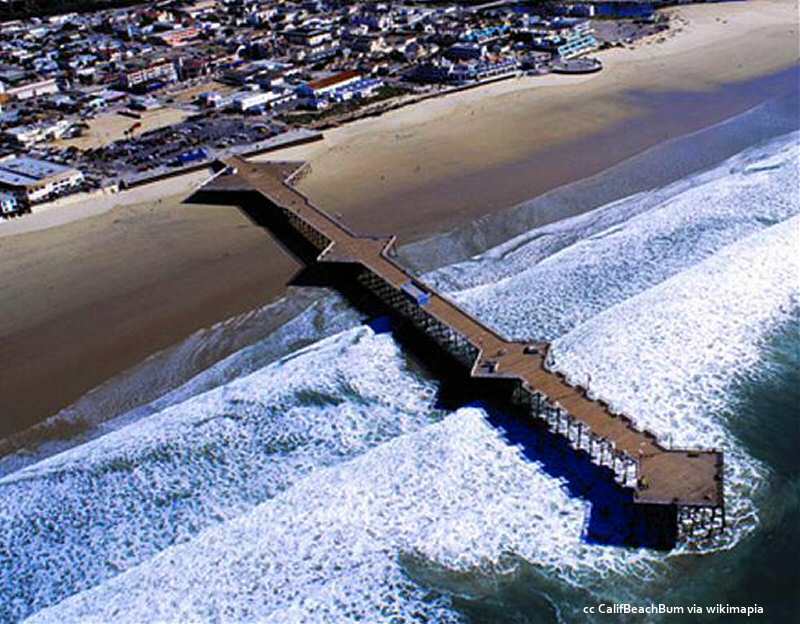 Extending out over the ocean, yet still connected to land - Central California piers and wharfs are an enchanting attraction. 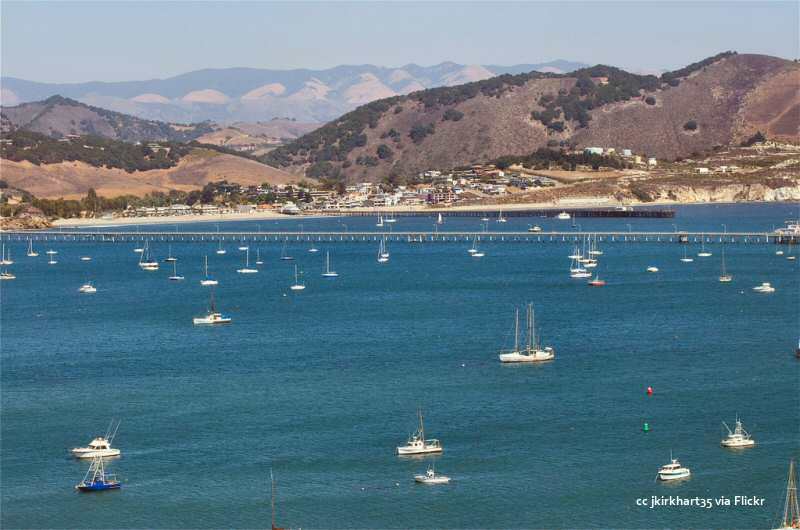 The Harford Pier at Avila Beach and the Fisherman's Wharf in Monterey are quite large and host restaurants and other businesses. Click on any of the following photos to view all pictures on this page in a larger size. 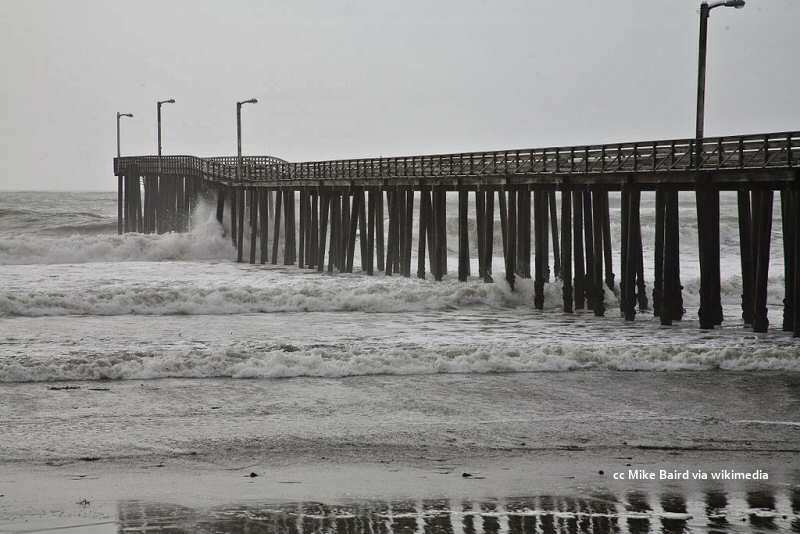 The pier is a lovely place for a romantic evening stroll with the accompaniment of the gentle surf below you. Time it right and you can view a moonset over the water. It's a rare thing, but you may even get lucky and see some bioluminescence in the water. On some summer days, the heat can extend right down to the waterline. 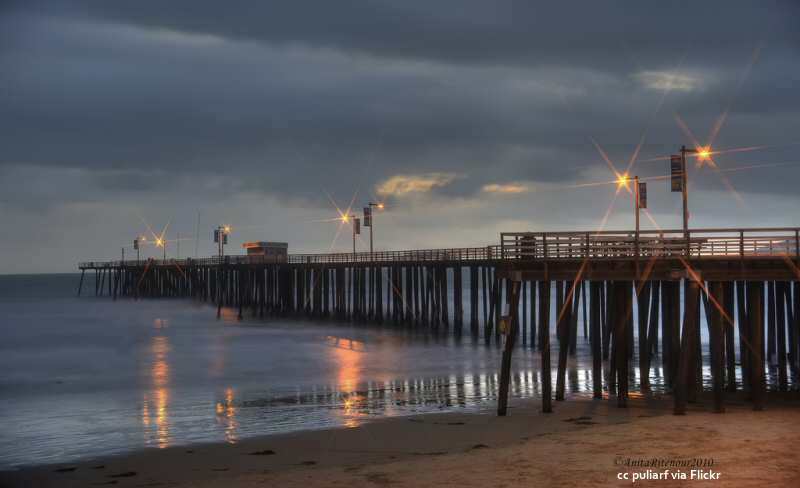 If you find yourself at the beach on one of those days, take a little stroll down the pier. You will find an invisible wall - on the shore side of the wall the temperature will be in the 90's and two feet further, once you're over the water, the temperature immediately drops to the 70's. A strange thing and a wonderful relief. Before the advent of the railroad and easily traversed highways, most of the commerce in Central California was conducted by ship and piers and wharfs were vitally important. Local products were shipped out to markets in San Francisco or Los Angeles and goods which weren't produced here were imported. Early on, during the Spanish and Mexican eras, ships anchored off the coast and goods were exchanged via small craft, powered by oar. That can be risky even in the best weather. The earliest piers were enterprises underwritten by wealthy landowners or by stock, forming a company which owned the pier. This made the shipment and import of goods much easier and cheaper. I have created a Google map with the piers in the area noted and with all the features that Google maps has to offer. Click here for that map (opens in a new tab or window). 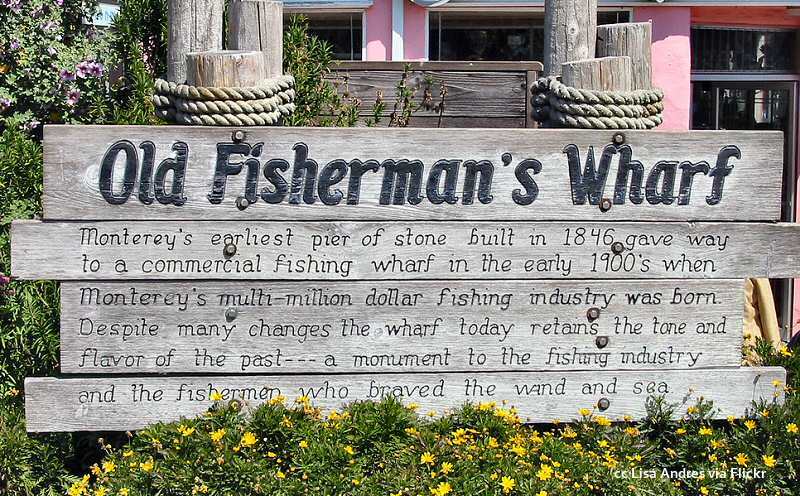 What with the railroads, highways and air transport, local commerce doesn't need the piers as it once did. Today they are more for recreation and for commercial fishing. Piers are also good places to watch wildlife, both in and over the water. If the water is calm and clear, you can see whatever might be swimming around down there. Being high overhead gives a good perspective into the ocean. The sea bottom under most of the central coast piers is light colored sand which gives good contrast. You may even see a shark! Sea otters, now being protected, have done very well and are a common sight along the coast. They are fetching little animals and quite fun to watch. They like floating on their backs and using their chests as a table when eating something they've caught. 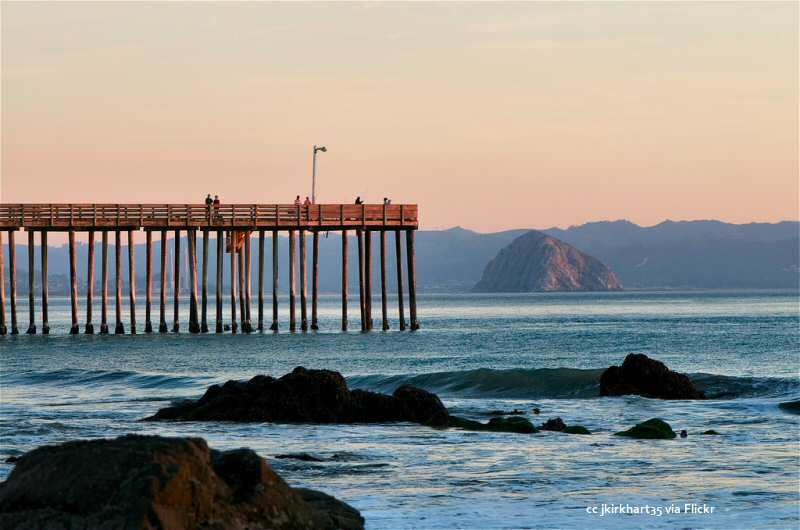 Unfortunately, you won't be able to have this view in person from the Cayucos pier for a while. This half is closed presently because of serious structural repairs which need to be made. 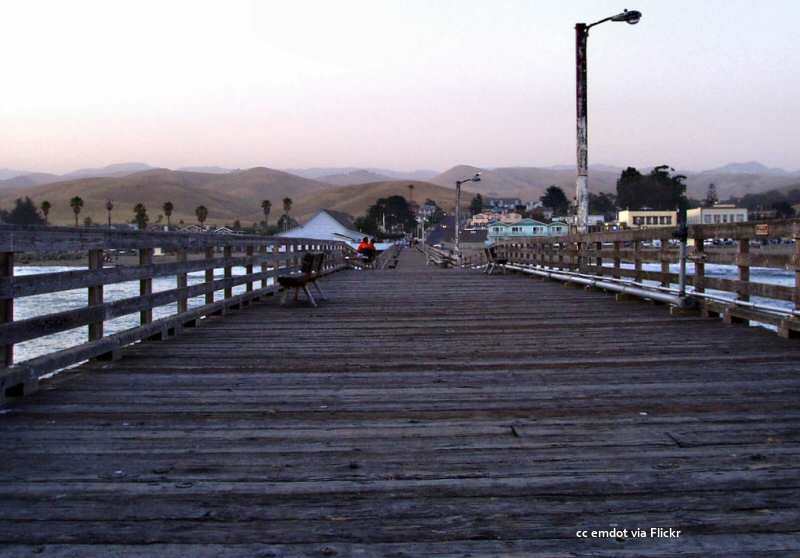 The Cayucos Pier Project is in the midst of raising $100,000 to demonstrate the committed support of the local community as well as visitors. 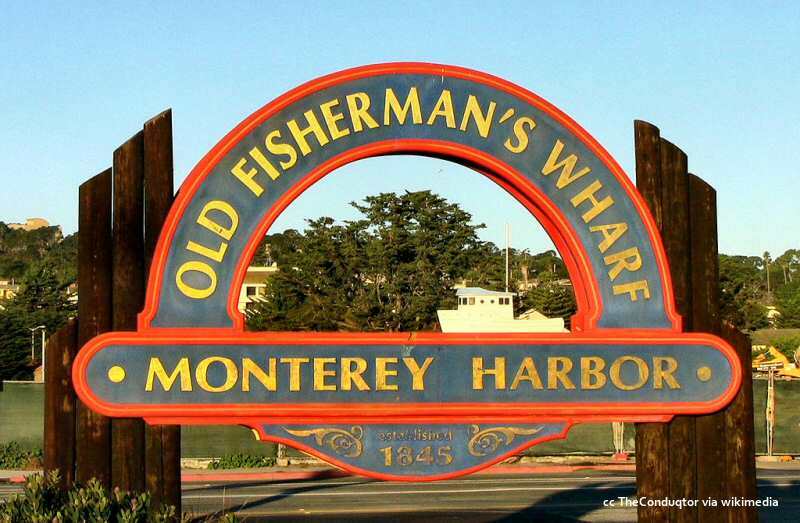 Monterey Bay still has a fishing fleet, as does Morro Bay and Avila Beach, but the wharf is no longer home to those ships. 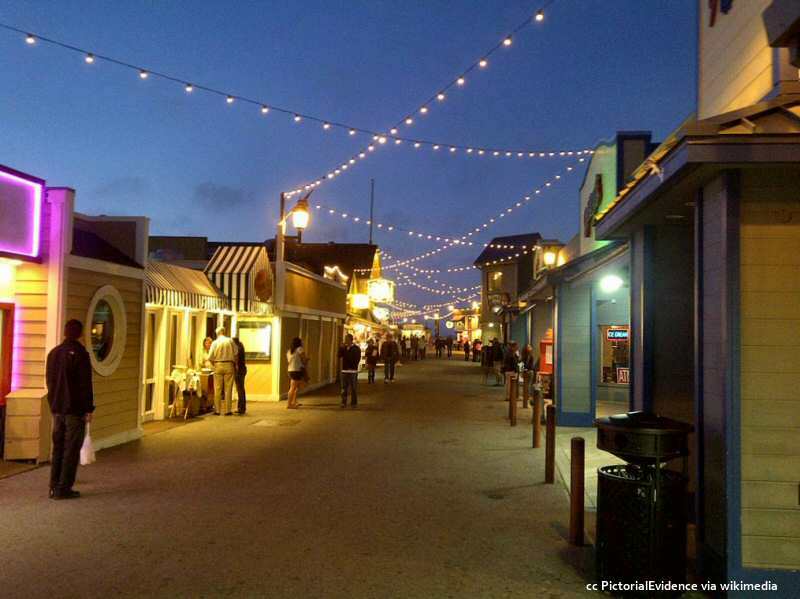 There are 14 restaurants and numerous shops of all descriptions as well as live theater. A fun place to visit. 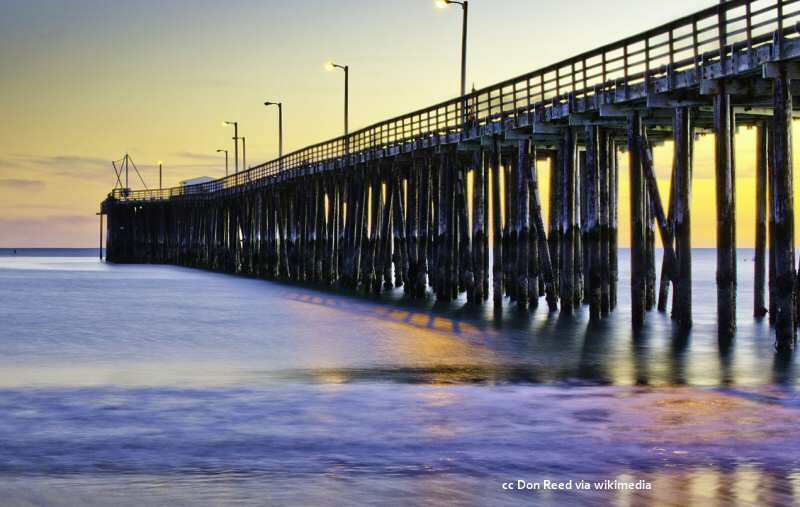 Q: Is a fishing license required while fishing from a public fishing pier in ocean waters? A: A: No, but it must be a public fishing pier...complete answer here at the Department of Fish and Game.